Landscape lighting refresh project – Phase 1 | Tales From The Ipe! For four years, I have been vexed by landscape lighting. The original owner had this mix of older style lights dotting the front and back yard. Some worked, a bunch didn’t, and there no lights where I wanted them. I also couldn’t understand the arcane timers on the power packs governing when they all turned on and off. The backyard patio lights that didn’t function at all bothered me the most, but the whole setup was annoying. I’ve called a number of companies for quotes, but they have all told me labor and parts would be in the ballpark of $6,000. I mean, really? I’ve tried to enlist friends to help me, but they’re all too busy for manual labor of that magnitude at my house. Screw it. Let’s just do it. They sell this stuff at the improvement stores. Anybody should be able to learn it and do it. I draft my son Joshua to help me figure it out, go to the store with me to select and purchase the parts, and to help me install. Phase 1 – pathway lights. 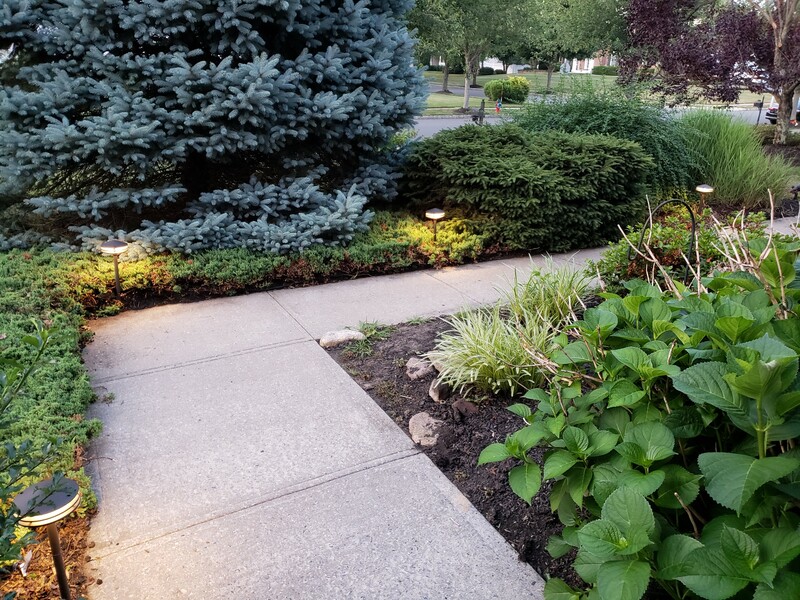 We went to Lowe’s on Saturday evening to select & buy new modern pathway lights (Josh’s style selection), wall wash lights, 14 AWG gauge low voltage landscape wiring, some flood lights for trees. We opted for Lowe’s Portofino line. I wanted to get a headstart Saturday, but it got late by the time we got home and it was so bloomin’ hot outside. We had spent all day in the heat and sun washing cars for a charity event at church, so I said we would try to get the front yard done on Sunday. Total cost of parts so far = $750. By 1PM, I removed mostly everything legacy, but it was hot as Hell. I took a lunch break to cool off. The kids came home from church, and I enlisted them to help out with burying wiring, assembling lighting fixtures, placing them, testing, and cleaning up after. I had to make two pit stops in the early evening to TWO different area Lowe’s stores to buy 5 more pathway lights so we could space them all between 6-8 feet apart. 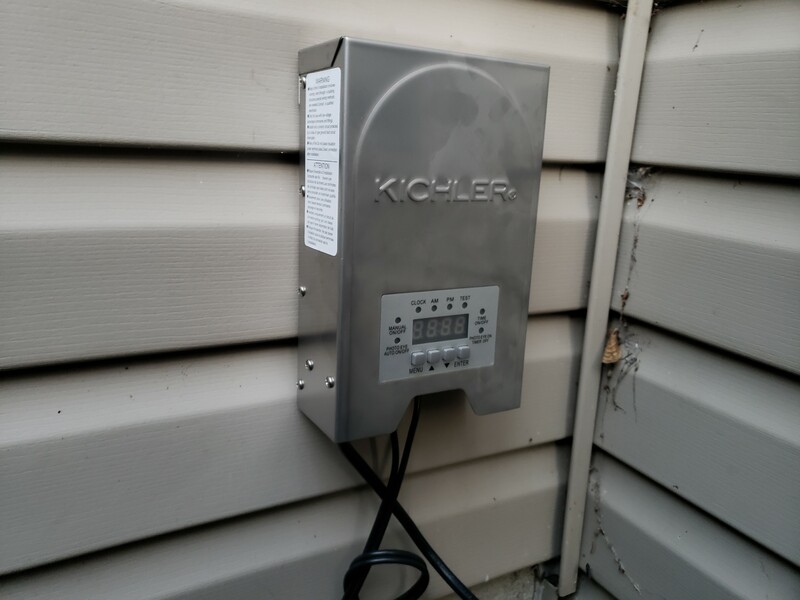 I also installed one out of two new Kichler power packs. We had working power packs, but this had a higher 200w capacity, and had a digital clock. Oooh aaaah. My objective is to complete phase 2 and 3 by Wednesday July 4th. We have some extended family guests coming over for lunch/dinner. It’s not required, but it’s better to set deadlines. Otherwise this may take another four years. Phases 4 will be to install new working backyard patio lighting. It’s pretty dark out there, so I’d like to finish these soon after. I don’t know if I’ll be able run low voltage lighting around the entire patio area, or if solar lighting is better and cheaper. I’ve used them in the past but they’re always getting damaged (wires cut or run over) by landscape crews. I’d also like to hang up string lights. I might go with landscape lights, string lights, or both. Phase 5 will be to replace the existing backyard lighting that does work, but it’s not a good layout. Lower priority. I’m hoping we get an early dismissal from work Tuesday afternoon, and have Wednesday morning available to work on these other areas this week. This entry was posted in News, Technology and tagged home improvement, landscaping. Bookmark the permalink.